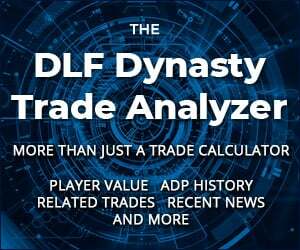 Need a last-minute starter for your dynasty teams? We’ve got you covered. Don’t fret, you are still at the Dynasty League Football website and not a weekly Bible study. The story of David and Goliath is oft quoted to describe any underdog situation. As a society, we are enamored with cheering for people to not only defy the odds, but doing so in simplistic yet spectacular fashion. Hollywood has capitalized on this desire as movies like the Mighty Ducks or the Karate Kid (the 80s version, not the nonsense remake with Jayden Smith!) highlight a person or team defying all odds to bring home the trophy. David’s slingshot, the Flying V of the Ducks, or Danielson’s Crane Kick all highlight an important idea; sometimes it only takes a simple action to bring down a giant. Enter the below list of players. Now let me be perfectly clear about one thing, I am NOT advocating starting anyone mentioned in this article over any reliable, consistent fantasy contributor or a stud player who has had a few down weeks. Please read my article from a few weeks ago if you’re considering this at ANY point during this stretch run. Ok, everyone just take a deep breath… you’ve made it through one of the craziest opening round playoff weeks in recent memory. Either you had one or more of Derrick Henry, Amari Cooper, George Kittle, or JuJu Smith-Schuster in your lineup; weren’t facing a team with any of those four players; or had a bye week. No matter the road traveled, you’re here in the semifinals of your league playoffs (or the opening round if your commissioner hates you). The players listed below (with the exception of Justin Jackson) are not recommended for those with heart conditions as they are extremely risky. To repeat from the opening vignette, DO NOT PLAY THESE PLAYERS OVER AN ESTABLISHED STARTER. A victory this week and you’ll be one win away from the holy grail of dynasty football and losing… is unacceptable! Allen’s rushing stats are literally saving his fantasy stat lines (QB8 in week 14) from being terrible. Keep streaming him at your own risk as sooner or later he’s going to hit his floor, and I’d hate for it to end your season. The rushing yardage total for Wilson Jr. was great, but the game flow (the 49ers jumped out to a 20-0 lead in the first half) made his receiving upside near non-existent. If Matt Breida is out, fire up Wilson as a low-end RB2 in a game against a streaking Seattle team which should resemble the matchup two weeks ago where he scored 19.4 points. Samuels’ day was solid, but he couldn’t reach his full potential with Ben Roethlisberger sitting out the majority of the second half. He’s a rock-solid RB2 for as long as James Conner is sidelined. Ridley is absolutely useless unless both Conner and Samuels are out of the lineup. If I would have told you on Sunday at 12:55 pm that Godwin was going to have a team-leading ten targets, you would have felt good about the final product. Godwin remains a solid flex play as the week 14 results were more of a fluke. Thomas led his team in targets and is a low-end TE1 for the remainder of the season. As a card-carrying member of the Kenneth Dixon Hopeless Losers Fan Club, I approve of this message. Lol! Ken, now is the time for you and your fellow truthers to celebrate! Enjoy! I’ve got Reed, Walker and Njoku… down to one now and wondering if I should drop Reed or Demariyus Thomas (behind AB, OBJ, ARob, Tate) and snag Ian Thomas…? Could also lose TB12 since I’ve got Jameis and Rivers. Capt, thanks so much for reading! Is there any way to put Delanie Walker on IR? I would absolutely pickup and start Ian Thomas over Njoku and that pains me to say as a Browns fan. Njoku hasn’t been getting the volume recently (only 3.5 targets per game in the last six games). I would hold onto D Thomas as he has much more value than either Reed or Walker. It’s close, but if you have both Ian Thomas and Njoku you will be set at TE for the foreseeable future. I’d keep Reed as his name recognition will command much higher value (DLF Dec ADP: 123.75) in a potential trade than Delanie (DLF Dec ADP: 221.5). Thanks for the advice! I’ve already got Guice taking up our IR slot… so guess I’ll drop Delanie. Man I’m definitely in the Justin Jackson Dilemma club. Would you consider starting him over Mixon, Chubb, Keenan Allen, Diggs, or OBJ (if he plays)? UPDATE: The chances of OBJ playing on Sunday just took a major hit today (https://bleacherreport.com/articles/2810642-odell-beckham-jrs-quad-injury-to-be-evaluated-at-hospital-for-special-surgery). I always say it’s important to practice what you preach, I’m playing Jackson over OBJ in a semifinal matchup this week. Jason, thanks for reading! First off, your team sounds stacked and while this is a good problem to have, making a decision to bench one of the stud players above is a bold one. I’m not benching Mixon, Chubb, or Allen for any reason whatsoever! While Jackson SHOULD receive RB1 volume if Gordon sits, it’s never a guarantee and I trust the volume of those three MUCH more. I know Diggs hasn’t put up elite numbers the past two weeks, but the Dolphins secondary is extremely vulnerable and I’m expecting a bounce-back week from all Vikings. That brings us to OBJ… He got in a “limited” practice yesterday (https://nypost.com/2018/12/13/odell-beckham-held-out-of-practice-but-seems-to-be-on-mend/) and appears to be heading in the right direction to play, but there’s still a ton of risk involved. The Giants have nothing to play for at this point in the season and have no reason to chance a serious injury to their superstar WR. Here’s what I would do: if OBJ misses practice today and Gordon is ruled out, start Jackson over OBJ. Anyone want to take a shot at this 14 team mess I have going on being a Gordon, Beckham, Cousins/Dak, and Brate/Engram owner. I roll out Zeke, Gordon, Fournette, Devante Adams, Tyler Lockett, Beckham weekly, plus own Chicago and Baltimore Defenses in a very high scoring defensive team system. Team finished 12-1 in very competitive league with 6 teams 9-4 or above and a ton of 4-9 teams. First Cousins has stunk. Home vs. Miami was my justification but firing OC, not feeling it. But then I need to run out both DAK and ZEKE. Then on the last day to pick up players for the playoffs grabbed Damien Williams in week 13 and also picked up Fitz who someone dropped in a 14 team 25 man roster league! So I have a QB decision, FLX decision and a TE decision to make. So anyone want to weigh in on DAK (with Zeke) at Tennessee vs. Cousins home to Fins? Brate and his 2 targets last week at home (both for TDs) vs. Engram with NO BECKHAM. 1- Damien Williams 2- Demaryius Thomas 3- Stills 4- Mike Williams 5- (the other TE Brate or Engram) or 6- Fitz who was inexplicably dropped in a league of this size. IF anyone can answer the QB and TE your gut tells you would be appreciated, but even more the two players of those 6 as my WR3 and FLX would be even MORE APPRECIATED! Oh and the 6 seed beat the 3 seed, which happens to be the only team to beat me with McCaffery. GOOD LUCK TO ALL THIS WEEK!!!!!! For your WR3, I’d play Fitz but I don’t feel great about it bc of how terrible their offense has become. At Flex I’d play Damien Williams. The QB choice is probably the toughest. Dak has been on a tear lately and Cousins has been the opposite. But, the Dolphins secondary is beat up and I really think the Vikings get back on track. I give the lean to Cousins.